Interrupting Chicken is a children's picture book by David Ezra Stein, published by Walker Books (2013). It's time for the little red chicken's bedtime story and a reminder from Papa to try not to interrupt. But the chicken can't help herself! Whether the tale is Hansel and Gretel or Little Red Riding Hood or even Chicken Little, she jumps into the story to save its hapless characters from doing some dangerous or silly thing. Now it's the little red chicken's turn to tell a story, but will her yawning papa make it to the end without his own kind of interrupting? Energetically illustrated with glowing colours and offering humorous story-within-a-story views this all-too-familiar tale is sure to amuse (and hold the attention of) the most spirited little chicks. Most kids love jokes. I think that authors and illustrators who build on that idea are cleverly helping children love to read. Stein seems to have written a variation of the Interrupting Cow joke. But what a variation! Children will chortle over each interruption and enjoy predicting the next one. Like the little red chicken, folks, kids do mean to be good. It's just that things pop into their heads, demanding to be expressed. Parents will nod their heads ruefully when they recognise the antics of a little red chicken who is not tired at bed time. The Book Chook remembers many a bed time story that resulted in her good self dropping off to sleep before a story was done. This children's picture book makes an excellent choice for libraries everywhere. 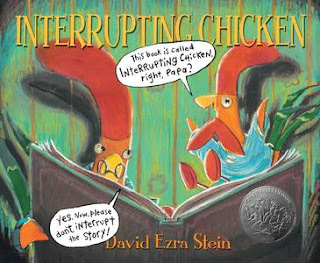 I predict Interrupting Chicken will become a favourite read-aloud in homes where great books are prized. I like the twist Stein gives the story, where little red chicken writes her own bedtime story for Papa. It would make a fun model for children to use in their own stories and pictures. Kids will also enjoy creating abrupt little-red-chicken-style endings for well-known tales. They could write them, design a booklet around them, create a comic, prepare an audio presentation or make a captioned illustration. Great jokes like those plead to be shared! Interrupting Chicken would also be an excellent springboard for a family, class or library collection of favourite children's jokes. Discover more ideas in Let's Celebrate Tell a Joke Day. I like the idea of the child writing his own story. Also can be used as a lesson for children who constantly interrupt. This looks perfect for my silly grandchildren! Must have it!